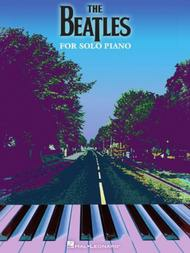 The Beatles for Solo Piano by The Beatles. For Piano/Keyboard. Piano Solo Personality. Softcover. 96 pages. Published by Hal Leonard (HL.307079).ISBN 1423484053. 9x12 inches.22 Fab Four faves arranged for solo piano, including: Across the Universe • Blackbird • Get Back • Eight Days a Week • Help! • Here Comes the Sun • I Want to Hold Your Hand • Love Me Do • Norwegian Wood • Penny Lane • Something • Ticket to Ride • With a Little Help from My Friends • and more.